Specializing in machine vision systems, software engineering, and real world business solutions. Let our years of application expertise and experience help you to improve throughput, increase reliability, and ensure quality in any of your product inspection and handling needs. The A.L.E.R.T. 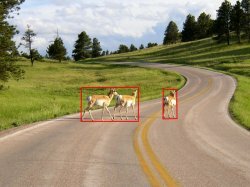 system is designed to detect animals crossing or present in a roadway and alert drivers to their presence before a collision occurs. Our projects deal with many engineering disciplines (mechanical, electrical, and software) and we are constantly thinking of the best way to solve problems. We work with customers to help define the best solution for a particular problem using every discipline at our disposal along with creative out-of-the-box thinking. Let Camrix Engineering help you to make your next system a success. Having designed a wide range of systems, from simple part identification to complex underwater submarine acquisition systems, we have the skills to get the job done right. System design is one of our specialties, we will take the time to make sure that the system we design and build is what you really need. We take pride in all that we do. Integrity, honesty, and a commitment to make all our partners succeed is what Camrix is all about. Helping our partners to succeed and profit enables us to succeed. In this day and age where customer commitment and satisfaction is sometimes lacking, Camrix is there to help define a new level of responsiveness and responsibility to our customer's needs.